If you are in a situation where you need a projector, and a relatively inexpensive one that has to be bright enough to use in living room or a conference room (especially high resolution isn’t vital for you, only a high-quality image with decent contrast and color), this projector is an SVGA LCD projector which solves all of your problems. It is a pretty affordable, but a quality product built by one of the biggest projector manufacturers out there. The most important thing to accent here is the fact that the Epson VS230 Projector is not primarily a home video projector or a home theater projector. It is an affordable presentation projector, ideal and built for offices and conference rooms with mild to moderate room light. 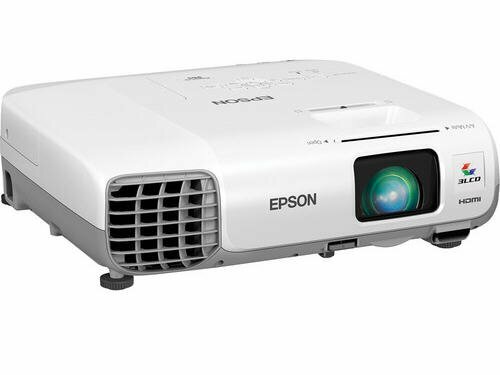 The Epson VS230 Projector’s image is lifelike and natural, even in its brightest modes. Dynamic mode on this projector is high in contrast and well-balanced. Moreover, colors are vibrant, while the image as a whole appears very natural. This model produces a sharp image and maintains perfect focus throughout the entire image. It also includes digital keystone correction meaning it will be much easier to make precise, small adjustments, as well as to go back to the neutral position later. In modes like Theater (more subdued mode), this great projector does an amazing job of balancing shadows and highlights as well as gives more detail to the darkest, deepest areas of the image. However, this reduces light output by nearly 40%. This projector produces bright colors which are well-saturated and rich, giving the picture inviting, warm feel. Unlike some really cheap projectors, this one utilizes a 3LCD light engine meaning that each primary color has its own LCD panel resulting in a variety and depth of color which cannot be seen on single-LCD projectors. This gives a more saturated and richer appearance to this model. When in Dynamic mode, this projector is able to put out more than 2400 lumens, and this is a lot of light. It is more than enough to put a really giant picture in a darkened theater room, or a television-sized picture in a bright living room. A two-watt mono speaker on the Epson VS230 Projector sounds pretty poor, but don’t get fooled by what’s stated on the paper-this little speaker is really loud. It’s more than enough volume for your living room with six to eight people chatting and moving around. Also, when watching a movie, or during quieter moments, you don’t even have to turn the volume on this projector very high. Moreover, if you turn the volume up to maximum, there is no reason you could not use this projector for backyard movies.